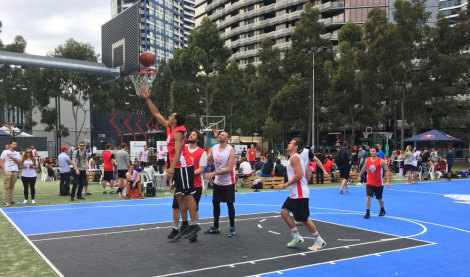 Hundreds of Australia's most elite ballers had their cages rattled by the boys from uni yesterday as Masunda, Stef, Smoke & Jack were crowned national champions in the Australian leg of the global Red Bull Reign 3 on 3 basketball tournament. We took out this years $6,000 prize from what was a really tough field including former NBL players Corey 'Homicide' Williams, Lanard Copeland, D-Mac and plenty of elite international, SEABL and Big V talent like Simon Conn, Maalo Hicks, Alex Bogart-King and uni's own Andrew Steele. In the elite eight knock-out phase, we had to get through the Red Bull Sydney champs and then a tough group led by Luke Egan and Simon O'Hea before facing off in the final against the Red Bull regional champs from Perth who had managed to knock out homicides tournament favourite team in their semi-final. With best man wedding duties calling, smoke reluctantly had to leave just before finals which left us a man down and without a bench. The boys took it in stride though as Nick & Stef combined for plenty of post & pop action and big Jack flourished in the half court format. In the final, some pure shooting and lock down defence saw the boys establish and hold a comfortable 5 point lead to take out the championship. 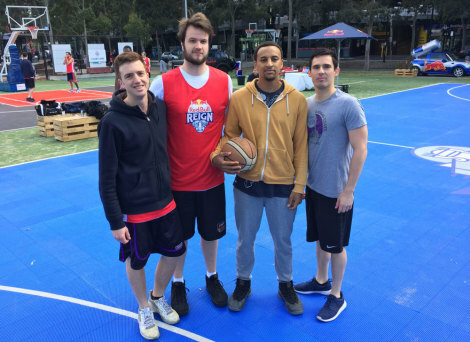 Yesterday's win reconfirms Stef, Nick and Smoke's title as Australia's 3 on 3 champs following their 2013 victory at King of the Court. We'd like to make a special thank you to Red Bull for putting on such an amazing event. The teams we met from Perth, Sydney and Brisbane had all been flown in and lodged in 5 star hotels and the atmosphere was electric. Red Bull arranged the MSF Sports court, DJ's, court announcers, on-hand physio/medical, food trucks with free meals for the players, fruit baskets, the NBA2K truck, tons of prizes and all the red bull we could drink. An unbelievable day for Australian basketball and an absolute honour for us to go all the way. © Melbourne University Basketball Club 2019. This page was last updated by smoke on October 25th, 2015.